Now there is a Neil deGrasse Tyson t-shirt that will make you want to be curious. This t-shirt comes in many colors and size and is available for men, women, and kids that like science and exploring things. 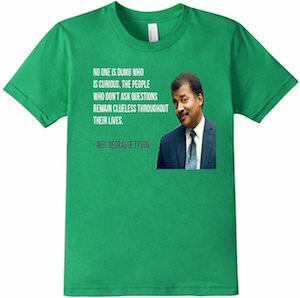 On the t-shirt you can find an image of Neil deGrasse Tyson and his name and besides that it also says “No One Is Dumb Who Is Curious. The people that don’t ask questions remain clueless throughout their lives. 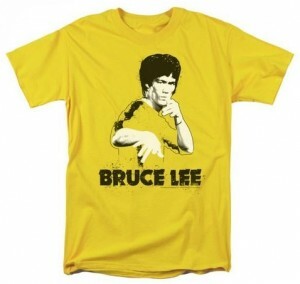 So if you don’t want to be clueless then wear this t-shirt and keep curious about everything life has to offer you. All kids need t-shirts to wear everyday, around town while they’re horsing around. 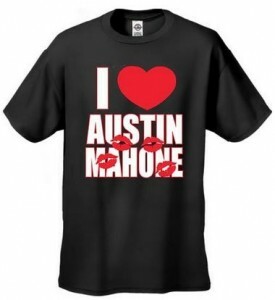 I’m sure they really like Austin Mahone, so why not let them combine the two and show their “love” for Austin Mahone with a T-Shirt. This t-shirt is simple and to the point. There is no mistaking what it is trying to say. I Love Austin Mahone. It says it right on the t-shirt and love is replaced with a large red heart. You will also find four lipstick kisses through his name too. It comes in 4 different colors, black, white, green and blue. It comes in XS to XL kids sizing. Let your kid be a little Mahomie in this great t-shirt for boys and girls.